With a new bike-share program nearing launch and the city preparing to drop $200 million on bike infrastructure, leaders in San Diego’s two-wheeled community push to add continuity and contiguity to the city’s policies. San Diego’s bike advocates are joining forces with officials to make moves on the Bicycle Master Plan. 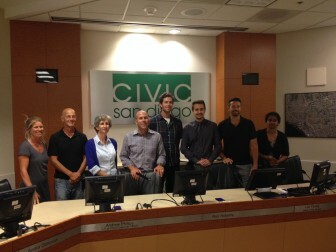 With the inaugural meeting of the city’s Bicycle Advisory Committee Wednesday, bicycle activists appointed by council members and representing several San Diego districts (Districts 4, 6, and 7 are vacant for now, but the positions will be filled) drilled into some key concerns in rolling out the city’s Bicycle Master Plan. With the delayed bike-share program finally set to launch Oct. 30, and a $200 million bike infrastructure overhaul in the works, supporters are banking on increased ridership in San Diego while continuing to push for safety improvements. “The theme here is safety,” said Andy Hanshaw, chair of the committee and executive director of the San Diego Bike Coalition. “We want safer places to ride, we want to feel safer. But we also want to move the needle to get more people to ride.” Making roads safer for bicyclists will encourage more people to ride, he said. Brian Genovese, a senior engineer for the city and a bike enthusiast, presented a report to the committee saying that casual riders would need a little extra care to get on their bikes and ride. “We’re trying to encourage more ridership and trying to attract that next level of folks. Getting the ‘interested but concerned’ really takes facilities [such as bike lanes and paths] that are attractive because they create a lower stress environment,” Genovese said. Genovese is the leader of a new “multi-modal” division within Transportation Engineering Operations for the city. This division works to increase road accessibility for other forms of transportation besides cars – i.e., bikes and pedestrians. One of his department’s efforts involves adding bike lanes, increasing buffer zones or drawing in “sharrow” markings – images of bicyclists painted on a road – to street repaving projects already under way. Adding onto these projects doesn’t require many more resources than what’s required to repave the road itself, so they come at little cost to the city, Genovese said. Sam Ollinger, a member of the committee and the founder of bike advocacy organization BikeSD, said Genovese’s and other city efforts can be decent improvements on problem spots for bikers. She pointed out stretches like University Avenue in Hillcrest where sharrow markings only appear on a few blocks and then disappear. The lack of bike route continuity can confuse riders and make it more dangerous to bike on the street, said Ollinger. She said that the markings on lanes keep drivers cautious of bikers on the road and more willing to slow down to give riders space. The new $200 million bike plan will address those problems in some areas. Over the next decade, the city will add bike routes, lanes and separated paths, according to SANDAG. Unlike the patchy sharrow and lane markings that Ollinger cited, the routes will contiguously connect neighborhoods across San Diego, with emphases in the Uptown and Mid-City areas.